TUVERA Exploration Inc. (the “Company”) was incorporated on March 19, 2013 under the laws of the Province of British Columbia in Canada. The Company is a development stage junior mining company engaged in the identification, acquisition, evaluation, exploration, and development of mineral properties in North America with current emphasis on parts of the Western United States. 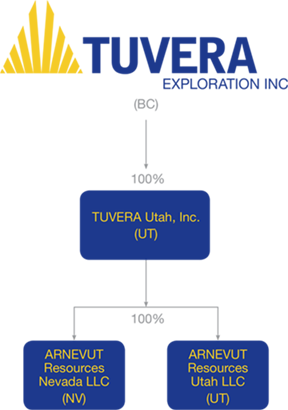 TUVERA Utah, Inc. (“TUVERA Utah”) is a wholly owned subsidiary of the Company, incorporated in Utah on April 15, 2013. This business unit of the Company was formed to allow exploration activities and permitting in Utah for the East Canyon property. Control of ARN and ARU was transferred to TUVERA Utah on January 13, 2014 when the merger with ARNEVUT Resources Inc. was completed through corporate filings in Colorado and Utah. ARNEVUT Resources Nevada, LLC ("ARN") is a wholly owned subsidiary of the Company, incorporated in Nevada on January 19, 2010. This business unit of the Company was formed to allow exploration activities and permitting in Nevada for the Island Mountain gold-silver property. Control of the Island Mountain property was transferred to ARN on July 1, 2010. ARNEVUT Resources Utah, LLC ("ARU") is a wholly owned subsidiary of the Company, incorporated in Utah on January 9, 2012. This business unit of the Company was formed to allow exploration activities and permitting in Utah for the East Canyon property. Control of the East Canyon property was transferred to ARU on May 23, 2012. ARU also has responsibility for the Blair silver property.